Replacement UPVC Doors and UPVC Windows, sliding doors and Bifold doors. Replacement UPVC Doors and UPVC Windows, sliding doors, Bi-Fold door and pergolas for your property renovation in Lanzarote, competitive prices and a fast and reliable service. Call us now to arrange a meeting at your property. UPVC is based on polyvinyl chloride (PVC), one of the most versatile polymers found in the century. PVC today finds application in almost all facet of our life, from daily use to highly sophisticated lifesaving applications. This flexibility of PVC is leveraged through a unique formulation to prepare a special UPVC blend for windows and doors. Choosing the right windows, doors or a conservatory for your home can be a challenge. You need to consider style, comfort, security, performance and durability, and importantly cost. Making the right decision will enhance the appearance of your home and increase the value of your property for years to come. We specialise in high quality replacement doors, windows, conservatories, orangeries, porches and other home improvements. All at prices you can afford! We’ve never wavered from that commitment and continue to grow from strength to strength. More than half a million windows and doors already have been successfully installed; thousands of customers full of praise for jobs well done. Take advantage of the information provided on our website to help you choose the right new replacement windows and doors. Aluminium frames are long lasting and tough, but they are often expensive and better suited to homes that are built in an ultra-modern architectural style. UPVC windows are a popular alternative material to aluminium. • Bay windows or bow windows. You can choose UPVC, wood or aluminium frames in a variety of sizes and different colours. The external doors to your home need to be strong, sturdy, secure and most of all look good. After all, the front door is the first thing that a visitor sees of your home. Exterior doors will fit and insulate better than older style doors. If you live in a modern house with existing UPVC double glazed windows, there are many different styles of exterior UPVC doors to choose from to match your individual taste and style of your property. There are a lot of options to create your individual design, from white to different oak wood grain finished and colours to various decorative glazing options. For replacement front doors UPVC, consider the amount of light you want let into your hallway or living room and the level of privacy you require. For a replacement UPVC back door or side door, this doesn’t require the same curb appeal as a front door. Often these UPVC doors are secluded and out of sight so think about good security. Double glazed UPVC front doors from panel doors, French doors, sliding doors and even stable doors, are all possibilities, as is the option to include glazed panels. Whether it’s durability, security, appearance or longevity that’s important to you, here at Lanzarote, we can match your needs. There’s a wide range of options, including colour finishes, glass designs and hardware that allows for extensive design flexibility. The latest construction technology brings you an exceptional standard of soundproofing and thermal properties. Thick, high quality PVCU that will resist discolouration for years – not days and months. One of the most important factors to you will be security; hence all our doors are equipped with high security Yale hardware as standard, the best you can buy. Every door is made-to-measure to meet your exact requirements and comes with a range of options. 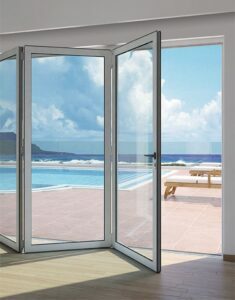 These include a wide range of styles, colour choice, selection of hardware, security upgrades and a variety of glazing. You can also think about using aluminium windows for your renovation project.